Once upon a time in a land far far away a young man found himself travelling miles from home with his pregnant fiancée to a town heaving with visitors. The emperor had decided to count his wealth and check that all his subjects were paying enough dues. Our young couple arrived tired and hungry having travelled many days to reach there. The young girl scared and heavy with child, wanted to lie down and rest but there was nowhere left for them to rent. Joseph, for that was his name, knocked on every hotel asking for a bed but they were all full. Finally a pub landlord taking pity on this young couple, allowed them to use a rickety draughty barn behind the pub. It was dry and warmish; there were animals already in there, but they could at least rest. Gratefully they moved in and settled themselves in for a long night. As Joseph slept, his fiancée Mary gently woke him to tell him the baby was coming. He padded around the little stable, not sure what to do as his beautiful bride to be cried out with pain, fear and emotion. He held her hand, wiped her brow and watched as she gave birth to a bouncing baby boy. The landlord had managed to dig out an old sheet for them to sleep on and Joseph carefully wrapped the baby in it laying him in the animals’ food trough. He gently caressed Mary’s shoulder; she soothed the baby’s tears. A group of cold tired shepherds came in from the hills around the town. They had received the heads up about a baby’s birth and had come to see what the fuss was for themselves. It took twelve days for Joseph to register his name along with Mary and their new born son; and for Mary to feel like travelling again. The night before they left was a clear starry night and they were disturbed again by three surprisingly rich men travelling to find a baby. A bewildered Joseph welcomed them into his humble stable as they offered their precious gifts to this tiny tot. The next day they all left and lived happily ever after. Well it didn’t quite end like that did it? Apologies as well for having adapted this story slightly. A story we all know so well, woven into the very fabric of our lives. Many people the world over will 2000 years later still; be celebrating the birth of that tiny infant so many years ago. They will be giving and receiving expensive gifts in remembrance of the gifts given by those wise men. They will eat drink and make merry in celebration of that baby lying in the manager from where animals ate their food. There will be a prolonged season of good will towards others, sending of cards, going out for drinks, the works party. Will we remember that tiny child who came to save the world, with every card we get, each drink we raise to the heavens? That swaddling babe grew up instead of happy ever after; his distraught, alone and tormented mother stood and watched him die on the cross like a common criminal deserted by his followers and friends. In a solitary strike against commercialism I gave up sending Christmas cards some years ago. I would find myself traipsing through shops looking for cards with a semblance of religious meaning; and found them increasingly rare. I am glad to note that charity cards are making a comeback; many with nativity scenes on them. I also resent the cost of the stamp when there were charities struggling to help really needy people. I, like many friends I now realise, have for the past few years donated a sum of money to a charity instead of the sending the traditional cards. This year my charity will be the Dorset Air Ambulance who are often called to the rugby club or the school fields where there is accessible space to land. Thankfully not all the time is it a rugby or school injury but the ambulance is the quickest route to hospital for anyone sick or injured in our town. I don’t have a problem with other people sending cards, although my mother was complaining it had cost her nearly £50 in stamps to send her cards this Christmas. With her generation it seems to be a way of keeping in touch although each year brings a spate of more sad news, as someone has passed on during the year. News we may have kept up with on facebook or twitter, if her generation were more technically adept. There is a flurry of consumerism that becomes more and more fanatical at this time of year. The news tells us we are in a recession, many people are out of work and struggling but the adverts are still full on with suggestions to tempt which they know will succeed because we cannot bear the thought of someone not having what they want. Children have switched on to Christmas in a big way. They watch the adverts; they comb through the Argos catalogue, and add all kinds of items to the shopping basket at Amazon. The list of things they have to have from Father Christmas is two A4 sides long. The same Father Christmas that they no longer believe in but would be horrified if he passed over the house on Christmas Eve and forgot to leave a stocking and present for them. Most children will have taken part or at least watched some form of nativity play these last weeks. Many of them will be humming carols and Christmas songs as they go about their daily toil of chilling out, now the term has finished. There will be a spate of Christmassy films on the TV for them to watch. A few will attend midnight mass with all its cheer and Christmassy music, and will the priest be giving out chocolates to all the children in the congregation again this year. Can No 1 Son and Middle Son still claim to be children in order to get the chocolate? How many people will stop and really think about the real Christmas? Who will go and wish the lonely old man next door a happy Christmas. Who will remember those who have lost loved ones in this run up to the festive season, when the grief is still raw and normal life cannot return? Which carols will be sung with true meaning remembering the story they tell and not just mouthing the words? Somewhere in our hearts let us show goodwill to others and help someone out over the Christmas period without the expectation of reward. 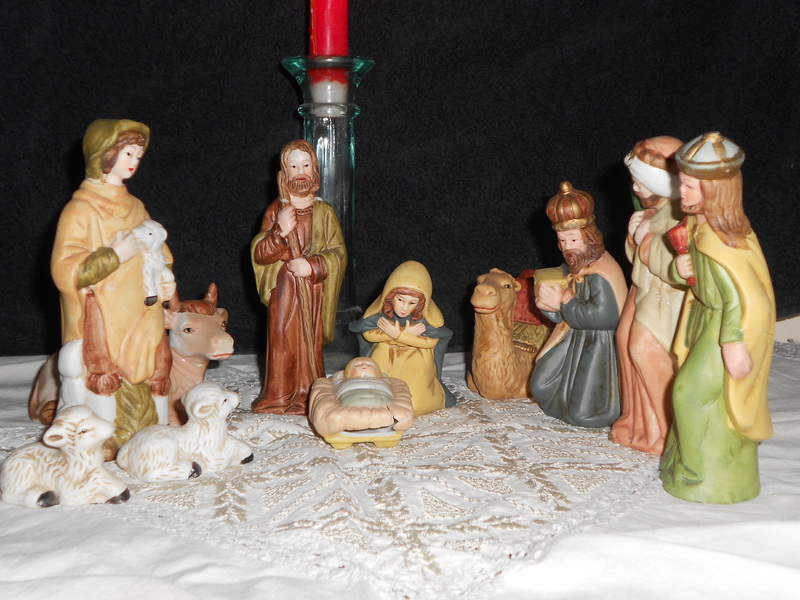 Each carol we sing out with enthusiasm and excitement; allow it to strike a chord as we remember the tiny baby born in a stable with the cows and sheep looking on. I wish all my readers a happy and peaceful Christmas. I trust my new year will be filled with exciting happy events for me to tell you all about and that my children continue to grow and do well at whatever they choose. I hope your new year will be filled with love, health and prosperity. Wishing you all a very joyful Christmas. Thank you for reading, subscribing and commenting on the blog.